Personal finance is the management of individual finance that includes budgeting, saving, expenses, planning, financial protections, and goal setting. Here individual means a single person as well as a family unit. To make it simple, personal finance covers everything that a person has to deal with when it comes to the money. Money comes and goes; it just doesn’t stick to anyone forever. So, dealing with both, incoming and outgoing money, is covered in personal finance. And the objective of personal finance is to deal with money in such a way that all the current needs, as well as future needs, could be fulfilled easily. We as a human being are dealing with personal finance since ever it was invented. Probably, the invention of money was the biggest invention as its impact is the highest. Money is now like circulating blood in a living body for human being’s social affairs. Every single living being on the planet is born with a single goal of living life as better as possible. And for the human being, money is the critically vital for making live comfortable. Hence, it is our core responsibility by birth to take care of our finance. We have to understand the importance of money in our life (it seems like we all know, but the fact is only a few knows it. And this is exactly why most of the people are living miserably.) We have to understand the science behind the money management. We have to give our full attention to personal finance. The first thing one need to do in personal finance management is to realize the self-current financial position. How much money is coming in and how much is going out? What are current, near future, and later future needs? How one is going to fulfill those needs? Is there any Plan-B? How one is going to fulfill the emergency needs? How family will run if the ultimate miss happening (death, disability, etc.) happened to the earner of bread and butter? And more. Next comes is figuring out what one need to accomplish. This is such an important thing as without a goal no one can reach there. Setting a goal not only help in giving our decisions a direction but also, give purpose to work for. When it comes to personal finance, it is important to make short term goals, mid-term goals and long-term goals. Personal finance example: if short term goal could be like buying a new car in a month or two. Mid-term goals could be like buying a home in next 4-5 years. And the long-term goals could be like getting retirement at the age of 55 years with say 10 crore rupees. The goal setting should be done in such a way that it just not overload on one’s head that makes him paralyzed to work. They should realistic and should seem achievable at a first or second glance. Then there is a need of making a solid plan which is executable practically. 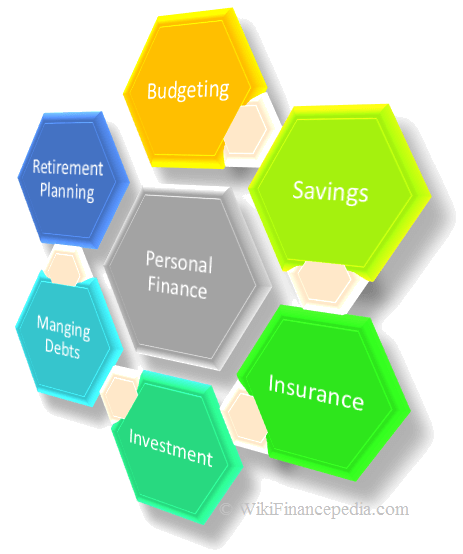 Personal finance plan must consider all the assets, resources, options, liabilities, protections, and everything else which revolves around money. One of the biggest mistake people usually make is that they just don’t include all the options they have. Today, there are several options for personal finance. For example – In order to save money for future needs (say the marriage of children), there are several options. One could save money in insurance, buy shares, bonds, mutual funds, saving in a post office, fixed deposits, invest in property, commodities, and several other things. Not only this, there are further several options with each one of these major options. Like—investment in insurance, there is several companies offering a big range of insurance products. Each one of them targets wealth accumulation along with protection benefits. Next, one needs to compare the insurance products (products with products as well as products from company to company). Hence, making a personal financial plan is the most important thing where one should put a great amount of time and energy. After this, one need to become determined to stick with the plan. Believe it or not, just sticking to one plan needs tons of determination (much more than it is required to make a sound plan). This is one thing with which we should stick to for whole life. One need to upgrade the options time to time which he has picked initially because the world is very dynamic, new options come in and old ones become obsolete. Personal finance management comes with practice. Just keep on practicing, hit and trial method is the only way to proceed, keep on refining, and meet the financial goals in the life. I usually do not have any idea the way i wound up here, but I thought this post was great. I don’t know who you really are but definitely you’re seeing a famous blogger related to personal finance articles 😉 Cheers!